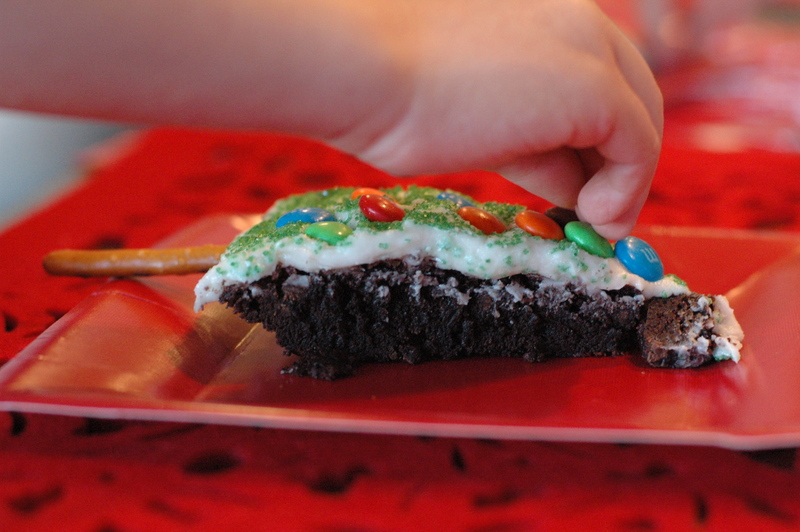 Here’s a super easy and super fun Christmas Treat! I brought these to our family Christmas, because I needed something easier to make than pie. You start with the Betty Crocker Brownie Mix and bake it in a pie pan. 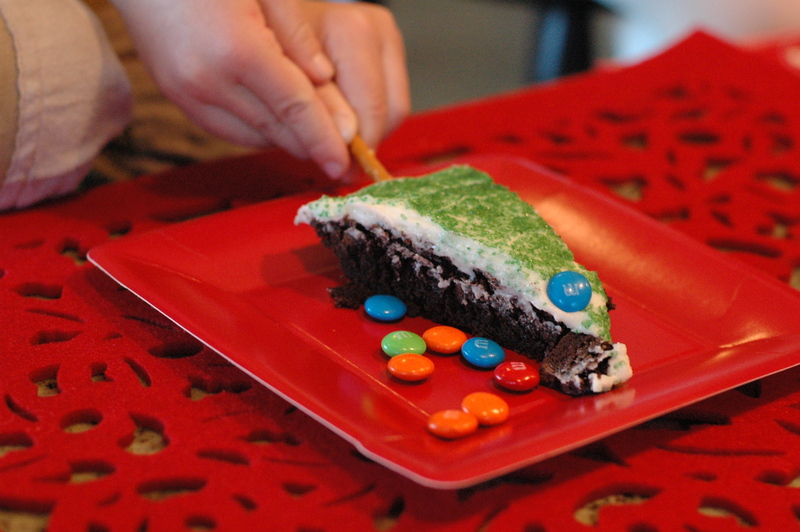 Top with icing and green sprinkles or green icing. 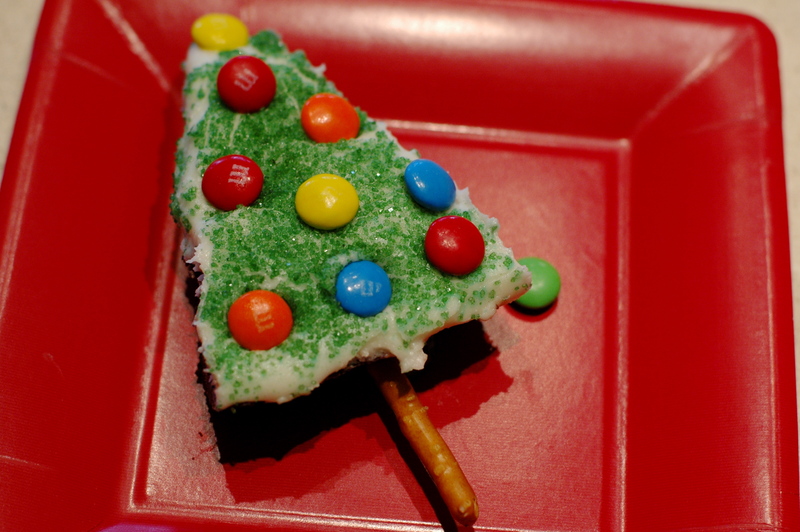 I brought it to the gathering this way, so that the kids could decorate their own tree with M&M ornaments and a gluten-free pretzel tree trunk. 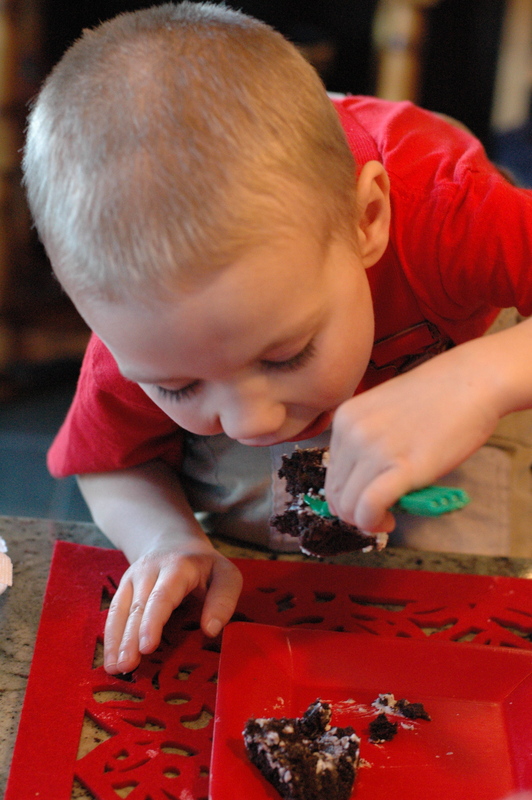 Thanks, Betty Crocker, for this great idea! I put 3 kinds of brownies to the test in a very scientific experiment to see which would come away with the prize of “best brownie”. To make things fair and interesting, I included 2 gluten-free brownies, 1 brownie full of gluten and sin, and 10 tasters. They say it’s a little thick, and they aren’t kidding! I don’t have an exact price, because I used ingredients I had on hand, but probably the cheapest option. You get to plunge the pan in ice water after it bakes too, which I’ll bet is great fun for any brownie. Each person got small pieces of brownies with colored toothpicks in them, then rated their favorites in order from most to least. 7 People tasted all 3 kinds, and 3 people (my 2 kids and me) just voted on the GF ones. Betty Crocker’s GLUTEN FREE MIX!!!!!!! The tasters agreed that they were all good, and the scores were pretty close. glutenfreegirl’s were a little too sweet for most people, but I want to try that one again with less sugar. The GF mix was more fudgey, and the regular mix was more cake-like. I still have a few tests to run before I’m settled with my favorite brownie. I’d like to find a homeade version, mostly for a cheaper option. But, for now, the Betty Crocker mix will be my choice for quick, easy, and yummy. Let me know what you think too!